Lender: Aetna Life and Casualty Co. 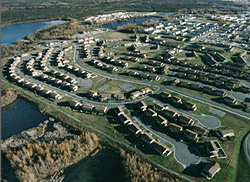 Features: Sprucewood Homes was the first project in the United States under the 801 Housing Program. The community provides housing for all income levels of Air Force families. When it foreclosed in December 1994, Polar Star Alaska Housing Corporation, under the ownership of Fischer Properties, purchased the property. Polar Star has completely refurbished the units, inside and out.